Trust and probate matters can be emotionally devastating as family members and friends are often pitted against each other while still working through the trauma of a recent death. Resolving these disputes requires not only knowledge of California probate law but also a firm grasp of the civil litigation process. Disputes are common in the administration of a trust or estate, especially when there are substantial sums of money involved or when the assets of a decedent are more complex than a simple piece of property. These disputes can arise between beneficiaries, between a trustee or other fiduciary and beneficiaries, or from third parties. This often leaves the bereaved family in a state of chaos and conflict. Our firm has extensive knowledge of the specific laws pertaining to California probate court and decades of experience litigating cases from initial court filing through to trial that gives us a distinct advantage resolving a wide variety of trust & probate disputes. 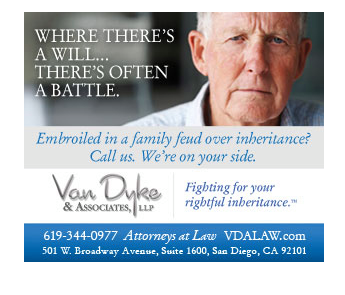 At Van Dyke & Associates, APLC, we strive to bring peace and justice to families during their time of grief. Do you need to Contest a Will or Trust?